This is the absolute best way to use photos. 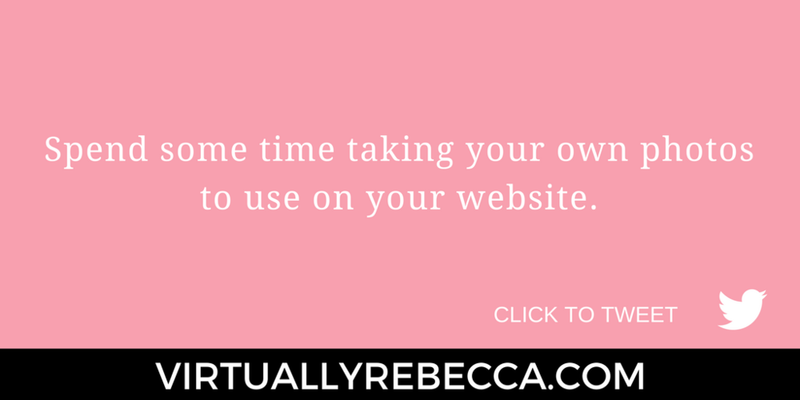 Spend some time taking your own photos to use on your website. Do you run an online store? Take a variety of pictures of your neat and organized workspace or your latest product additions. Are you a coach or consultant? Ask some friends of yours if you can use their lovely faces as background for your social media posts. Be sure to get their permission BEFORE you post their picture anywhere online. You’ve found the perfect photo or image for your next blog post, but you have no idea if it’s copyrighted. Then go ahead and ask the author. Often the copyright owner’s contact information is included with the image. Contact them, letting them know how much you love their photo or image, and the reason you’d like to use it. They will most likely give their permission. Be sure to give credit where credit is due. Even if they do not ask for credit, I highly recommend you include a “Thank you to ____ for the above image”. These images fall under the Creative Commons (CC) License. They can typically be used in any type of setting - displayed on your website, edited to match your brand, or included in printed materials - without permission from the author. Be sure to check the terms and conditions of the images listed under this license. Although these are free to use without permission from the author, it’s your responsibility to use common sense, making sure you are not impinging on the rights of others (think logos, people, property). Some of my favorite places to get images with a CC license for free are Pexels, Pixabay and StockSnap. If you’re not sure if the content can be used, then DO NOT USE IT. It’s much better for you to search for a different image than to have a complaint filed against your website or blog, or to find out if you’re being sued for infringement of copyright laws. The Internet is full of amazing images and photos that can be used to enhance your website. Make sure to do your due diligence and use common sense when researching the proper use of online photos and images.